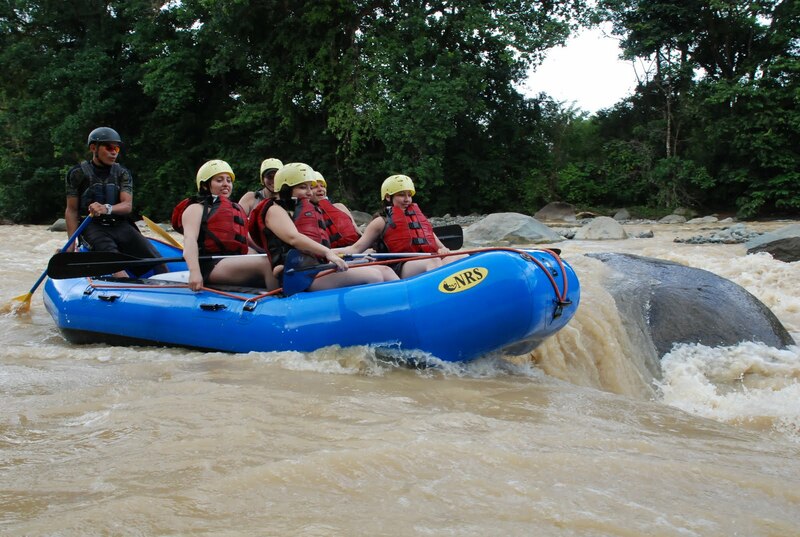 Whitewater Rafting in Manuel Antonio, Costa Rica! A Splash of Adrenaline! I like to periodically share with my readers some of my favorite tour companies in the Quepos & Manuel Antonio, Costa Rica areas. Therefore, as we get ready to enter our “green” season (green=more rain), this means some of the best white water rafting is just ahead on the horizon. I can’t think of a better company to share with you then the great people at Amigos del Rio (“Friends of the River”)! Offering world class Whitewater Rafting only a short distance from the new Quepos Marina and famous Manuel Antonio Park, Amigos del Rio features challenging whitewater rafting on both the Savegre River (“Wild River”) and the Naranjo River (“Orange River”), with incredible views of rainforests, waterfalls, flora and fauna. 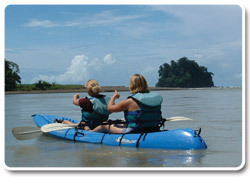 Not limited to just rafting, Amigos del Rio guides visitors along the Manuel Antonio coastline for Ocean Kayaking, or choose the unique opportunity to explore the Damas Island Estuary Mangroves as you glide along in your Mangrove Kayak. Safe, Unique, Reliable and Intense Water Adventures are what Amigos del Rio lives for! Beyond the incredible Class II, III & IV rapids, be astounded by the awe-inspiring canyons, waterfalls, and primary rainforests that are an integral part of the beauty of Costa Rica. The Savegre River is truly a magnificent stretch of whitewater, winding through a sparsely inhabited mountain crested valley and offering some of the most exciting rapids and beautiful tropical scenery around. The full day Savegre River Rafting Excursion includes a hike to one of these majestic waterfalls, leaving time for guests to go swimming in the natural waterfall ponds. The Naranjo River drops steeply from the coastal mountain range above Quepos through a beautiful jungle gorge, and takes you on a wild ride all the way to sea level. Passing local farmlands and palm plantations, the river banks team with green jungle and meet the steep canyon walls at sharp 90 degree angles. 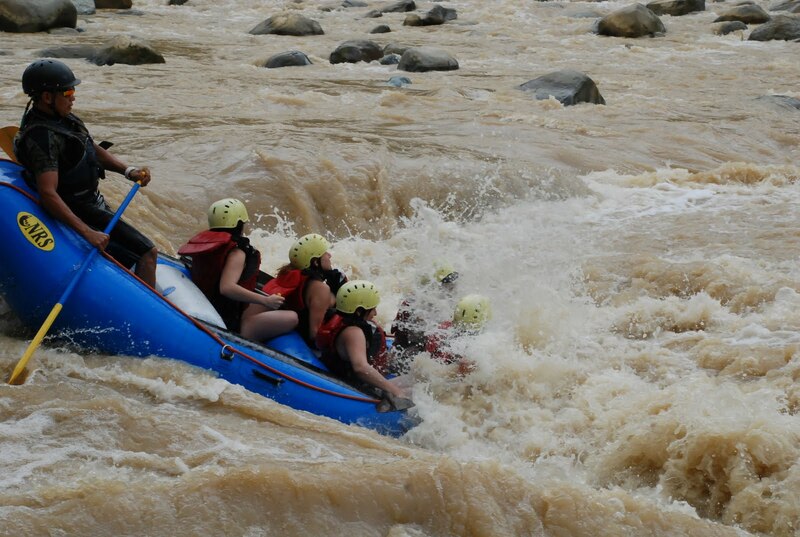 Even for the advanced rafter, this Class II, III & IV river is an exciting and refreshing rush of adrenaline. For those beginner rafters, our well trained river guides will explain, teach, direct and inspire even the most timid of rafters will want to meet the Whitewater River challenge! Designed for beginner or advanced kayakers, you start with paddling along coastline of Quepos and the offshore islands by ManuelAntonio National Park. Experience the excitement of paddling a kayak in the open ocean, while observing Costa Rica’s marine and coastal wonders, such as the nesting grounds of endangered sea birds like the Brown Boobie, as well as sea turtles, fish, dolphins, whales and other seasonal marine life. Sea kayaking is considerably easier than river kayaking, and most trips can be done by guests that have little or no experience, so don’t miss your chance to try this exciting sport! This tour will show you nature’s unparalleled wonders as you explore an entirely different eco-system just 10 minutes from Manuel Antonio and Quepos. Kayaking (or boating) through the mangrove canals is like a meandering ride through times gone by. Let the current carry your kayak as you observe the unique flora, fauna and wildlife found only in this biologically diverse heaven! 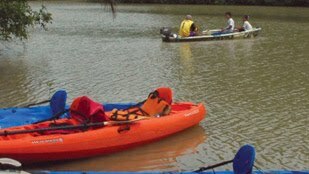 Beginners will delight in the ease of paddling through protected inland waterways, while your guide points out and explains this unique jungle environment. The exclusive fleet of transportation for Amigos del Rio includes brand new Microbuses and 4×4 vehicles rarely found in Costa Rica such as the HUMMER and the UNIMOG. Adventure tours should only offer the best in safety and equipment, so for that reason, Amigos del Rio chooses to use high performance AIRE rafts, specially design for our favorite rivers. Complete relaxing “Tico” style meals are provided on the tours, with refreshments and local fruits. There’s no hurry on these tours, time is on your side. The Amigos del Rio gear is all U.S. Coast Guard approved and operated by professionally certified guides that have past extensive safety guidelines. Amigos del Rio is a fully insured and bonded company. Their team of expert guides is all formed by locals who have grown up rafting these rivers, and know their business better than anyone! From the owner to the reservations personnel, they guarantee the level of safety and fun you are seeking, all supervised by the Amigos del Rio professional team of Whitewater Rafters. They love what they do and it shows! 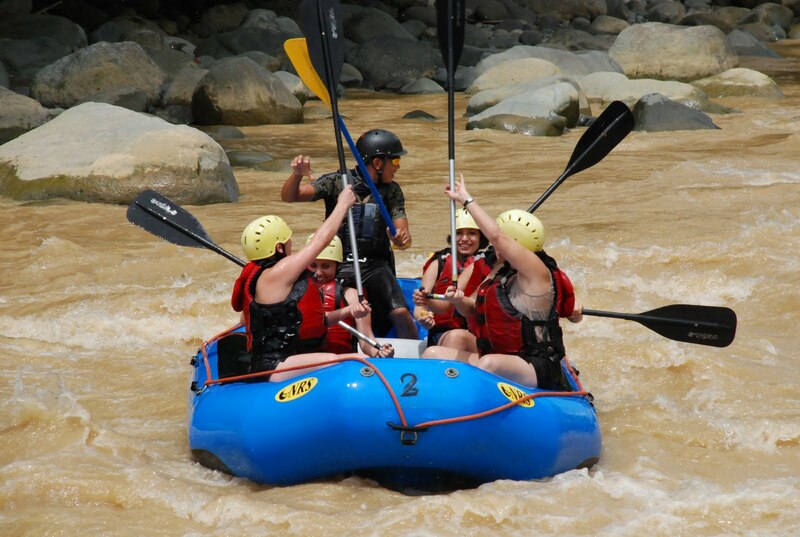 So if you find yourself traveling to the Manuel Antonio and Quepos area of Costa Rica, and you are looking for the adrenaline rush of a lifetime, while enjoying the wonders and scenery of Costa Rica, don’t wait……sign up with Amigos del Rio, and you too will discover the fun and adventure of Whitewater Rafting!! 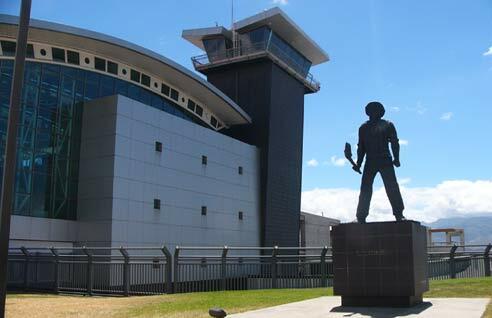 This is where the dispute of the true legend of Juan Santamaria begins. Heated arguments and several investigations suggest that the well repeated history of Juan Santamaria may not be all it’s cracked up to. According to Steven Palmer, a Canadian researcher, Juan Santamaria was possibly invented by the Liberalist Costa Rican government. 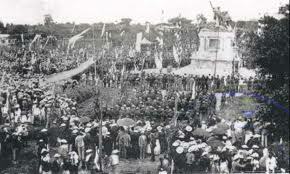 Palmer’s study suggests that the government in the late nineteenth century was seeking to create a national identity in order to unify the disorganized country. Legends, heroes and battles, all helpful ingredients in the creation of a sense of national patriotism, the government set out to find something or someone that would serve its motivating purpose. 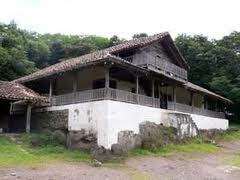 Since Costa Rica lacks a history of warfare, the Liberalist government chose one of the few significant battles, the 1856 Battle of Rivas fought against William Walker. After choosing the famous battle, a brave hero was to be chosen as their new “symbol” for National unity. With this, Palmer says, Juan Santamaria was “born” or reborn after being dead and forgotten for many decades. That Juan Santamaria was a member of the lower classes, only served to inspire an even stronger sense of belonging to a nation that was coming of its own in world recognition, as Juan Santamaria showed anyone could become a National idol.